Cynthia Lai, in middle, widow of Manh Nguyen, killed in a Tantalus shooting, knelt in front of the altar during funeral services yesterday. Nguyen's son, Victor, and daughter, Christina, joined their mother. MANH THE NGUYEN, shot dead at Tantalus Lookout while on the job as a taxicab driver, was remembered for his devotion to his family, his good humor and his work ethic, as mourners filled Borthwick Chapel to overflowing yesterday. "Look at how many people are here today," said attorney Michael Wong, pointing to the crowd of fellow cabdrivers, friends and dignitaries, including Gov. Linda Lingle, paying their respects at Nguyen's funeral. "He was a good, honest man, and it shows." "Look at his children and what they've accomplished. When I first met him he could barely speak English, and look what they've done." Nguyen, 50, who immigrated to Hawaii from Vietnam, just watched his son Victor, 17, graduate with honors from McKinley High School, with college scholarships in hand. He last saw his 13-year-old daughter, Christina, as she headed off to a summer program on the mainland for some of the nation's brightest students, run by Johns Hopkins University's Center for Talented Youth. 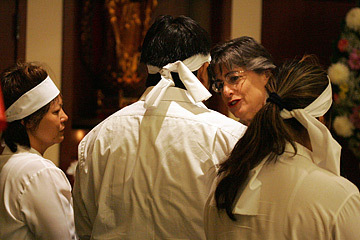 The children and their mother, Cynthia Lai, wore white sashes of mourning around their foreheads at the ceremony as the Rev. Tri Hai led mourners in chanting the Buddhist sutra in Vietnamese. Offerings of fruit and other food and drink were placed at the altar, and the scent of incense and sound of chimes filled the chapel. "My dad was a good man, a good husband and a good father to all of us," Victor Nguyen said in brief remarks. "I'd just like to thank everyone here for coming here and supporting us in our time of need." 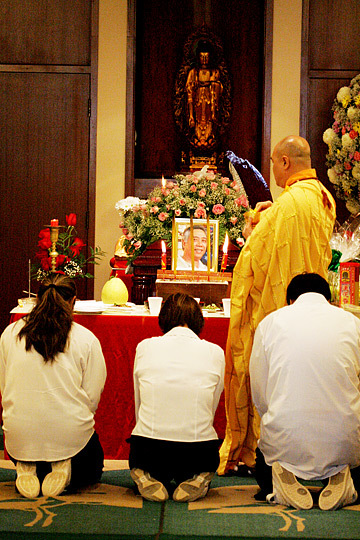 A Buddhist memorial was held yesterday for taxi driver Manh The Nguyen, who was shot dead at Tantalus Lookout on July 6. Gov. Linda Lingle visited with Nguyen's wife, Cynthia Lai; his son, Victor; and his daughter, Christina. Adam Mau-Goffredo, who has a history of paranoid schizophrenia, is charged with murdering Manh Nguyen and Colleen and Jason Takamori, both 53, after getting Nguyen to drive him to Tantalus Lookout on July 6. Nguyen, nicknamed "The Manh," was "certainly one of the most professional drivers in this taxi industry," said Howard Higa, president of The Cab Co. "He was a happy driver, always laughing, talking and joking with people in the company," Higa said. Tom Nguyen, a fellow taxi driver, played tennis regularly with Nguyen and agreed with Higa's assessment of his friend. "All the people liked him," Nguyen said. As an inspector for the state, Wendell Murakami deals with hundreds of taxi drivers, and said he has been impressed with the Vietnamese drivers' commitment to their families and the education of their children. "They'll do anything to give a better life for their children," he said. "You see a lot of immigrants whose children excel. That's the way it was for Mr. Nguyen. He was always positive." Murakami shook his head at the family's loss. "This is so terrible," he said. "A car accident is one thing. This is just too much." After a pause, he added, "When you look at the kids, Mr. Nguyen did leave something behind for all of us. Somehow, they really are going to make a difference." A separate fundraiser for Manh Nguyen's family is also planned this weekend. Donations and proceeds from a raffle will go to his family.